You can get access to Company’s products and services after quick registration of your UBK Markets account. To do this, you just need to click on the Register button on the upper panel of the website. Having filled in all the fields, you can use opportunities that are available only for registered Customers of the Company. 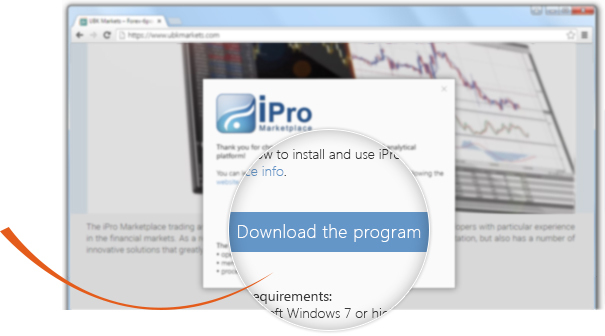 In order to trade, you should install iPro Marketplace trading and analytical platform, which you can download on the Install the platform page. This platform will allow you to operate in the financial market with maximum comfort and absolute confidence in its technical reliability. A prerequisite for the first launch of iPro Marketplace is to open a trading account in “My Account” section and become familiar with contract specifications on the Trading Conditions page. From this page you can go to trading conditions for each type of account the Company offers: Classic account, iPA-Manager account, iPA-Investor account. 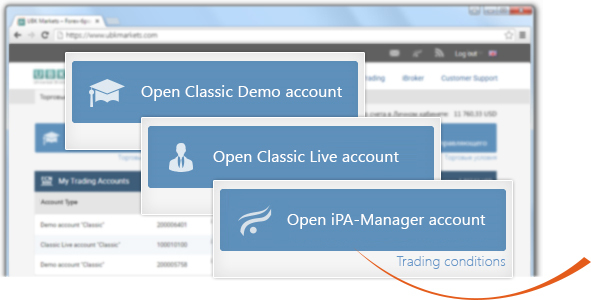 Classic account is the right choice for those Customers who prefer classic trading. Trading conditions for this account type are the best offer for traditional trading: optimal initial deposit, minimum commission, floating spread, etc. 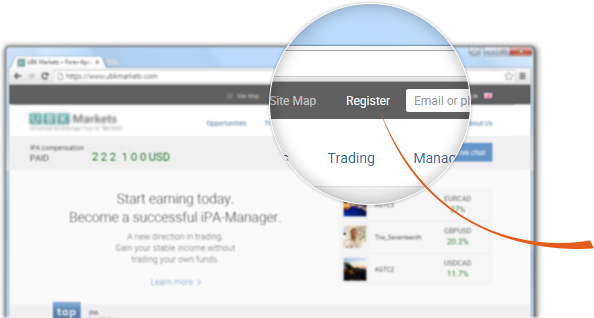 iPA-Manager account allows you to trade applying the innovative iPA technology. The distinctive feature of this account type is that there is no trading deposit, commission, maximum balance level and other conditions for executing trades. iPA-Investor account assumes making a profit from copying iPA-Managers’ trading signals. This account type is characterized by the most favorable size of leverage, commission and the initial amount of the iPA-Investor’s own funds that contribute to getting a truly high and stable income. If you have any questions, you can find answers at the UBK Markets info and iPro Marketplace info reference portals. Every day these resources help our Customers to get full information on Company’s products and services. You can also consult our specialists from the Customer Support via your UBK Markets account.